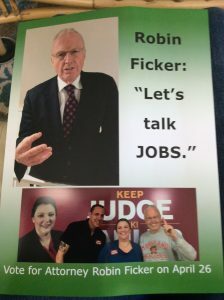 I wrote yesterday that some Republican voters in Maryland’s 6th Congressional District were a bit surprised to see Washington County Circuit Court Judge Viki Pauler‘s picture on the front of Robin Ficker’s latest campaign mailer. 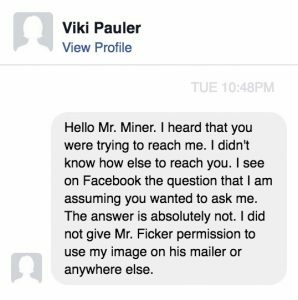 I also wrote that I presume Robin Ficker did not first solicit Judge Pauler’s permission to use her picture in Ficker’s latest mail piece. Yesterday, I contacted Judge Pauler’s campaign via email, asking whether she or her campaign authorized candidate Robin Ficker to use said photograph on his campaign mailer. Judge, is it any wonder that Robin Ficker’s law license was suspended twice? He just can’t seem to do the right thing. Ficker uses the same reckless disregard when placing his 4×8 campaign signs throughout the 6th Congressional District: he doesn’t first seek permission from the property owners before placing his signs. Not exactly a smart move to irk a sitting Washington County Circuit Court judge, especially when you tout yourself as a “Western Maryland attorney.” I’d hate to see what it would be like for Robin Ficker to be in Judge Pauler’s courtroom. Robin Ficker: shoot first, aim second.